Coming of age in a new millennium, I’ve always been in pursuit of instant gratification. I can remember the first time I saw a 3D printer, or at least a video of one, was in a drafting class I took in high school (about 2005). I was instantly in love with the idea. It was like a tiny instant gratification machine. It seemed perfect. You wanted something, you made it. Sometime in the last few years, Jason began researching 3D printers and decided our house needed one. I loved the idea but knew nothing about 3D modelling or machinery. I asked him to teach me, but with a full course load and a job, he had no time. He showed me where to download Sketchup and showed me a few basic functions. After that everything I asked was met with the answer “figure it out yourself”. I thought this seemed harsh at the time, but realized, months later, when I was designing and printing on my own, that he simply knew I would take those words as a challenge. As it turns out with the free software Sketchup, there are a wealth of tutorials online. I spent many hours reading tutorials and asking advice in online forums. Our Solidoodle 3 came for Christmas, assembled, and in a big cardboard box marked “Solidoodle”. We were a little put out that the mail man just put it on the porch and walked away without ringing. Luckily none of the neighborhood kids thought it would be useful enough to steal off of our porch. It took a little bit of setting up, but we were printing the first night we unboxed it. I started learning to work the machine and cut my teeth designing and printing smart phone dummies (again, thinking about how often I let my cell phone act as an instant gratification machine). They were relatively simple to design and wouldn’t take much time to print. Still, my results were quite rocky at first. As it turns out, our several hundred dollar instant gratification machine worked better as an unending frustration machine. As simple as the design really is (heating up plastic and layering it on a heated bed) there were a million things to go wrong. As many times as I was able to print successfully, there were whole days where we could barely get the machine to do more than shoot spaghetti-like strands of plastic from the seams in the extruder. So we ended up breaking a few parts, replacing them with better pieces, modding the printer to work better and crying with joy every time we could get it to run for a few days without problems. Over the course of the winter we took the entire printer apart and reassembled it, reconnecting wires with ease. This was my introductory course to machinery. While it still had problems frequently, we were then better able to address them. 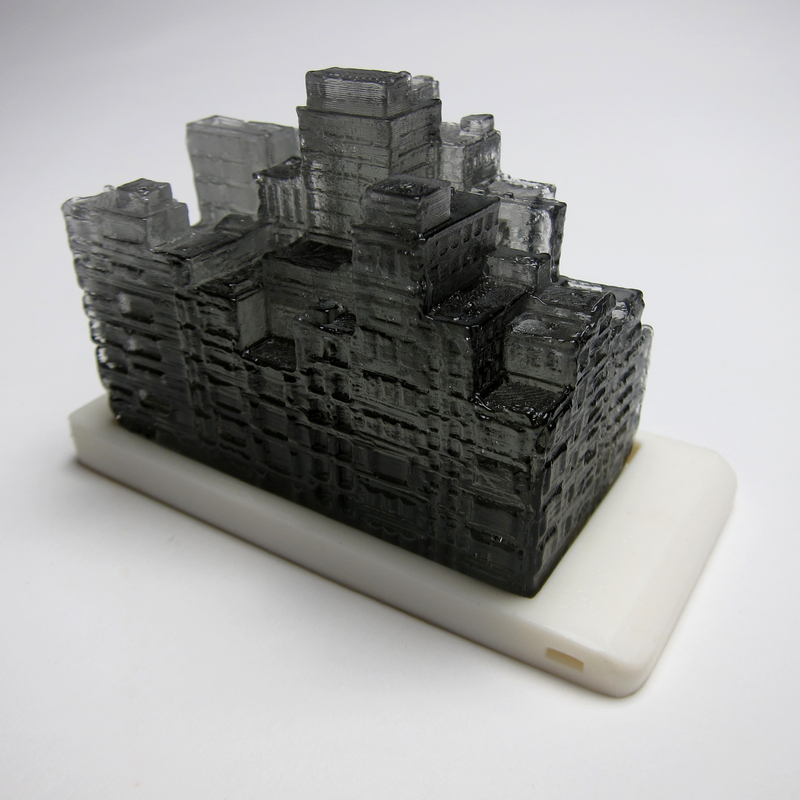 My experiment printing dummy phones turned into a few planned art pieces that would combine the plastic dummy phones with glass cast inserts in the shape of crowded city tenements. I found that printing models to cast was a great use of the new machine. Before, if I wanted to cast something, I’d have to carve the item out of wax first. This process is effective, but would be ridiculously time consuming to make something as detailed as a tiny model city. At the time, I’d been reading a lot of dystopian novels and was thinking about the cultural extremes that exist today. My model cities, made up of clustered tenements would be juxtaposed against the height of new technology: the smart phone. I was finishing up a residency after graduating college and had access to kilns and supplies, so while I was more exciting about 3D printing than anything, I knew it’d be a good idea to combine the two materials. I printed the phones and the models for the glass pieces. Those models I would make molds of, pour waxes and then use a lost wax casting technique to cast the glass pieces I needed. In contrast to the rocky time I’d had 3D printing them, I was able to cast 4 glass pieces successfully on the first try. At the moment I have a few more glass castings I’m working to finish up and incorporate into an installation. I’ve got another project involving the 3D printer that I’m very excited to start work on. In the next few days I plan to start fixing the 3D printer again (after the thermister has wriggled loose yet another time). I’ll be posting updates as I fix, modify and likely cry over our little art-making machine. 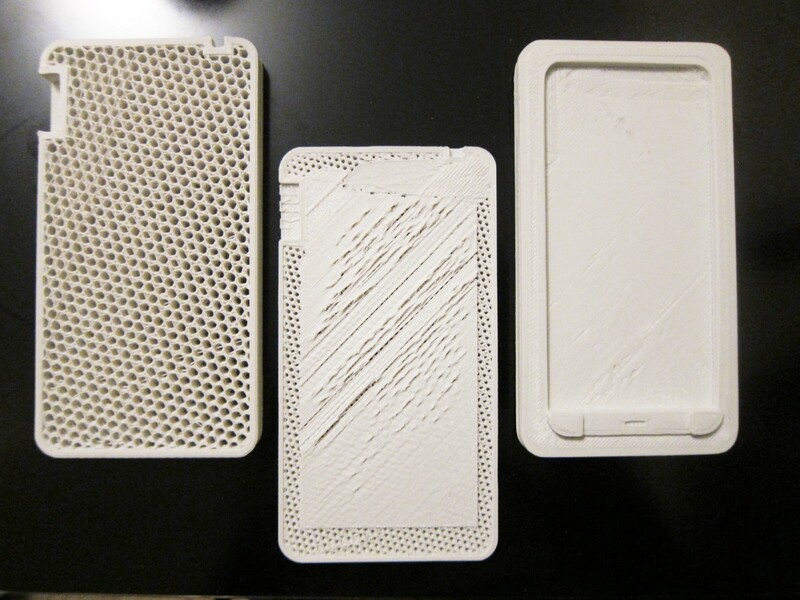 I’d love to hear your thoughts on 3D printing and any of its possible art-related uses.